Throughout this month, I’ve looked at games where it’s possible to pit the Dark Knight against the Man of Steel to see who would win. However, neither of those games were truly about Batman Vs. Superman. What happened if an event so horrific caused the DC Universe’s brightest beacon of hope to go dim? Who would oppose a man who many see as a God? That’s the central conflict in which Injustice: Gods Among Us frames itself. Injustice is what Mortal Kombat Vs. DC Universe sought out to be, and is a game that like the Mortal Kombat reboot before it, shows the talent of the development team at Netherrealm Studios and how they’re changing the fighting game space in fantastic ways. It also happens to be a must own for either fighting game or DC Universe fans and also is more feature rich than games in the genre being released this year. In a parallel universe to the main line DCU, the Joker succeeds in tricking Superman into killing Lois Lane and her unborn baby, creating the catalyst that finally causes the Man of Steel to do the unthinkable: kill. With the line now crossed, Superman sets out to make sure a tragedy like this never takes place again. He takes all the world’s power into his fist of steel, convincing others to join his cause and creates a massive army to enforce his will. This however also creates a rebellion led by none other than the Dark Knight, Batman, who at his most desperate point, transports heroes from a world where this tragedy never happened to not only save his world, but make sure this never comes to pass elsewhere. The story of Injustice: Gods Among Us is a powerful “What If?” tale that really drives home one of the greatest fears shared by every hero and villain in the DC Universe: What if Superman uses his power not for the betterment of mankind, but to enslave it? Similar to the model started in Mortal Kombat Vs. DC Universe and continued in the 2011 Mortal Kombat reboot, the story is told through multiple chapters where you use a character for several fights before moving on to someone else. The campaign is fairly lengthy for a fighting game, and gives you a good feel for the game’s mechanics before going up against actual human competitors either locally or online. It’s also a very well told story, and you’ll find yourself pushing through just one more character to see not only who you’ll be using next, but how events will continue to unfold. The campaign is told through cinematics that are really well choreographed and great to watch, but also add player interaction periodically through simply quick-time event mini-games. Though none are terrible difficult or advanced, it’s still nice to have something to do while a cut-scene is playing out, almost like in a Telltale game. Aiding to the authenticity of the campaign are many returning actors from prior DC work like the amazing Kevin Conroy as Batman, George Newbern as Superman, Susan Eisenberg as Wonder Woman, Khary Payton as Cyborg and Tara Strong as Harley Quinn. Popular enthusiast character actors like Firefly alums Alan Tudyk and Adam Baldwin and Neil McDonough round help to round out the cast and are very true to the character’s they’re playing. Outside of the story campaign, there’s still lots to do if you’re either a person like myself who is terrified of playing a fighting game online, or further want to refine your skills. There’s multiple arcade modes where you can set your own level of difficulty, number of opponents, or specific stipulations like only going up against villains for example. Something missing from Mortal Kombat Vs. DC Universe was a Krypt equivalent that makes a return in this game as S.T.A.R Labs missions. Coming in at a daunting three hundred missions, you play through a series of missions as every character in the extensive roster and try to satisfy whatever stipulation a mission throws at you. This sometimes means completing a fight while debris is falling on top of you or trying not to take any damage in a certain amount of time. Other times it means playing a mini-game like controlling a cat who has to avoid guards and jump over lasers or using Superman’s special moves to protect people. Though completing all the missions will take you a long time, especially if you wish to get a three-star ranking in all of them, they can get rather tedious to complete, especially given how many there are to do and they don’t have the backing of the main campaign’s story behind them. For those who simply must do everything though, it will certainly give you a lot to do and will allow you to better learn all the characters that Injustice has to offer. 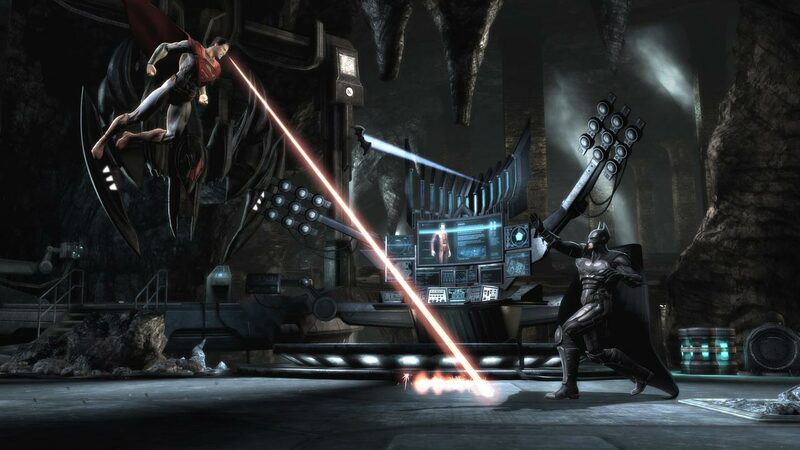 Injustice: Gods Among Us was initially released in 2013 but had a lot of post game support through DLC in the forms of new playable characters and character skins for those who were already in the game as well as additional S.T.A.R Labs missions. The Ultimate Edition released in the fall of the same year collected all that onto one disc and for the current generation of consoles, is exclusive to the PlayStation 4. When it was new, the Ultimate Edition offered fantastic value and it still does now nearly three years later. Injustice was already a game stuffed with content and the Ultimate Edition just gives you even more. For those who like to have everything on disc, like myself, it’s the best way to own this game. It also shows how pathetic a game like Street Fighter V is when it launches with a fraction of the content upon release just one month ago. Even though Injustice is a game that was programmed for the last generation of consoles, there’s still a lot of depth to be found in the fighting mechanics that make it worthy of being on the PlayStation 4. 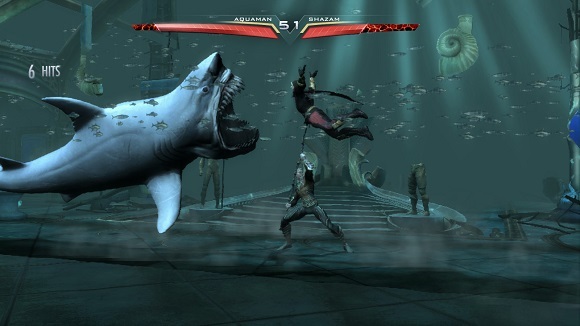 Removing the pesky 3-D found in Mortal Kombat Vs. DC Universe, it plays nearly identical to Netherrealm’s last game, Mortal Kombat (2011), which is by no means an insult. That game learned how alive 2-D fighting games were with the success of games like Street Fighter IV and the hype surrounding Marvel Vs. Capcom 3. You have three attacks and a modifier activated by hitting the circle button which can do everything from throw a simple projectile or surround your character in a shield. Every character has a long string of moves to pull off and combs to be learned by performing attacks in certain sequence and yet while it can seem overwhelming, the moves and combos for those who just want to have a casual brawl are easy enough to learn and pull off and there’s plenty of depth to be found for those who love to do things like count frames of animation and watch hit boxes. While the entire game takes place in a 2-D plane, you still have to be very mindful of your environment. 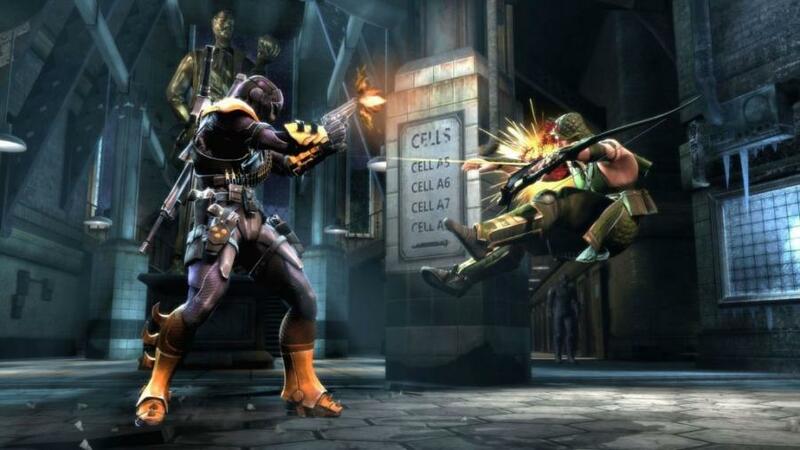 Not only can you transition to new environments when you perform a certain attack like in Mortal Kombat Vs. DC Universe, you can also activate traps by hitting switches or throw items from the background at your opponents. This can help even the playing field for someone when they’re on the ropes provided they’re mindful of their surroundings, This new addition is a welcome one, however like Mortal Kombat Vs. DC Universe, there are some new mechanics that maybe should’ve been left on the cutting room floor. Like Mortal Kombat (2011), you can build up a super meter and activate a super move equivalent of the X-Ray attack found in that game that are brilliantly character specific. Batman for example will attach a device on someone and then drive the Batmobile into them; Green Arrow will shoot a volley or arrows at an opponent in the air and Superman will launch someone into space before pounding them down to the ground. These are great to watch even after seeing them a hundred times, however what you can do instead of these special moves are not as great. In a match you can sacrifice a portion of your super meter and put you and your opponent in a “clash”. What this does is stops the match and asks a player to hit one of the face buttons and hope it matches up with whatever one the person who initiated the clash did. Most of the time this will unfairly cause you to lose power, or just end in a stalemate. It’s one of the low points of Injustice but not enough to tarnish the rest of the package. Though people will never admit it, the studio that would go on to become Netherrealm made a really great DC fighting game in Mortal Kombat Vs. DC Universe that was overlooked by a lot of people. Without the baggage of the Mortal Kombat license, Injustice: Gods Among Us has allowed Netherrealm to make the ultimate DC fighting game that’s not only a dream come true for fans of the license but a great time for fighting game enthusiasts or casual players who just want to throw down as their favourite DC heroes and villains. 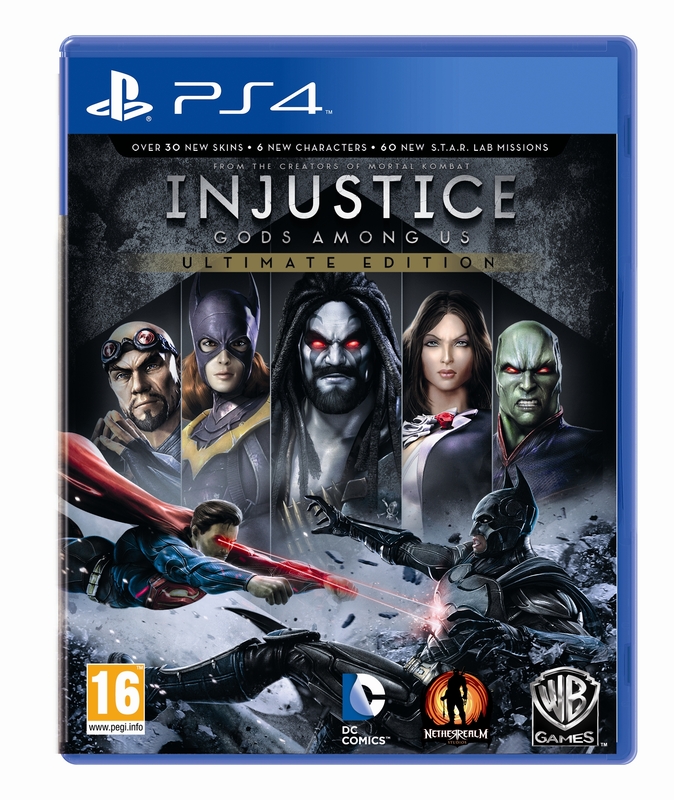 With a compelling to play through campaign and lots of content on disc to play through before you even go online, Injustice: Gods Among Us is an absolute must own, whether you have the Ultimate Edition or not. I’m glad at how this turned out. Netherealms didn’t make this into a bloodbath like Mortal Kombat. Instead, it focused on the narrative and made some nice twists for many of the characters. I did also like hearing, some of the veteran voice actors reprise their roles. Some personal favorites were Harley Quinn, Lobo, Deathstroke and Aquaman. I very much agree. I was reading the comics up before the release which fleshed out the story really well and got me even more excited for the game. I love how Netherrealm puts such great context to the fights in their games. Didn’t read the books until I played the games. Very nice fighter, though!